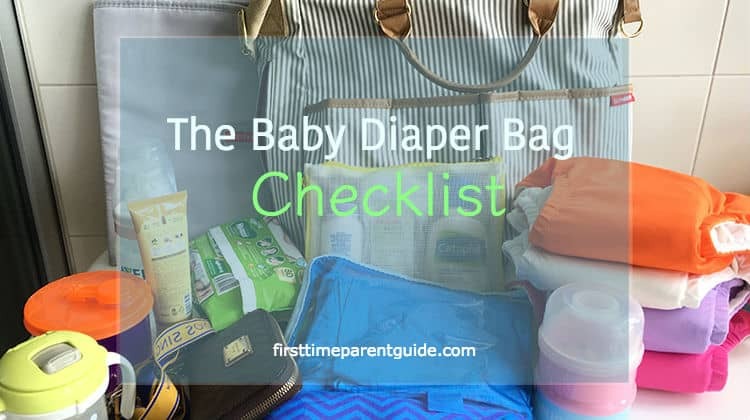 Because packing for a young baby seems to require bringing with you the whole house, LOL, one needs to have The Baby Diaper Bag Checklist so you don’t end up throwing random items inside your bag. Bring the amount of water needed depends on your child’s age. In a case when your child drinks 7 ounces of milk 3 times a day, you can bring two bottles with 7 ounces of water each. If you are nursing, just throw in your nursing cover and an extra pair of breast pads. There are instances that you are bringing expressed breast milk if you are exclusively pumping. Put them in two bottles and make sure your diaper bag has insulated pockets so that you don’t need to bring an extra insulated bag. Depending on your child’s age, you should also carry extra water in a sippy cup. 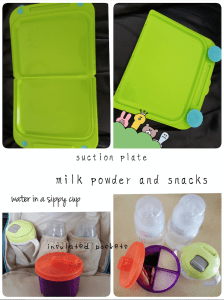 There are a lot of containers that can both accommodate the milk powder you need and some snacks. You can scoop the milk powder you need and put them according to the portion advised and throw in some snacks as well such as raisins, cereals, or baby biscuits. Depending on the age of your child, you can bring a spoon and a suction plate. Although most restaurants will have kiddie plates and spoons, the last thing you will want is for your little one to throw the plate accidentally on the floor. It also helps that your child eats on a familiar plate and use a spoon she would usually use. Some parents have time to cook their baby’s food. You can bring them also if you have home-cooked baby food. Bring a few bibs as well. While some will advise bringing one diaper for every hour you’re out, carrying eight diapers for an 8-hour outside trip will bulk your bag. Think about the rest you’ll need to pack. Some diapers are very absorbent and depending on how often your little one drinks milk and water, there are hours your baby is not actually peeing. Some diapers can last you for four hours. So if you are going out for 8 hours, you might just need two disposable diapers, plus an extra one just in case your little one decides to poop. Based on experience, 3 is more than enough for an 8 hour out of the house trip. Your little one is also wearing one that means you have a total of four diapers with you. You can just bring the whole pack that usually consists of 80-100 wipes (depending on the brand). A half-used pack should also be more than enough. It is quite compact, so you do not have to count how many pieces to bring. Make sure though that it is more than ten wipes because there will be a lot of instances that you will need it and not just for cleaning diaper areas. You can also bring a small bottle of mild cleanser to thoroughly clean diaper areas. You will need a hand sanitizer not just for cleaning your hands after diaper changes, but also before making milk (if feeding formula). A hand sanitizer is a must especially when water and soap are not accessible. If there is no available trash can, you need to store soiled diapers in a plastic bag or a reusable bag until a trash can is available. There are also instances that your little one will spit up or you might accidentally spill something. Therefore, you need this bag to store the wet clothes and baby blankets. If your little one is inside a cold mall walking around in clothes that are meant for warm weather, chances are they might catch a cold. If they don’t want to be sitting in the stroller with a blanket to keep them warm, you should change them in clothes that can at least make them warm. That means changing from a sleeveless/backless top to a sleeved one or a top that covers their backs. You can also put them on pants or short pants depending on how cold the mall is. You also wouldn’t know when they would spit-up or spill milk and waters on themselves. This instances will also need you to change their clothes. In a case where your child refuses to wear a cap (like my daughter), make sure to put the stroller’s canopy over their head if it is extremely hot. If you are carrying them in a carrier, you can shelter them with an umbrella if your culture is using umbrellas (like mine). Some countries don’t actually use umbrellas often so make sure to put sunscreens on your little one’s skin. There are times when you need to carry your child so you should bring a sling or wrap and tuck them inside your diaper bag. If you are using a hip seat carrier, you can hang them in your stroller. 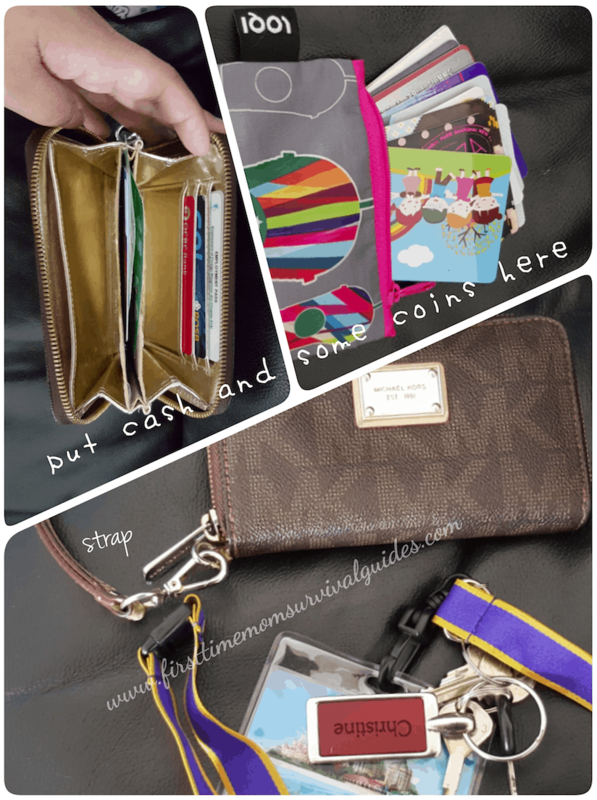 You can re-organize your wallet in such a way that all the immediately needed ones are in the “main wallet.” It is also good if your wallet has a wrist strap so that you can just leave it strapped on your wrists while you still need them. An example is when you take public transportation and you need to use an MRT card or some coins. You can put the rest of your other cards (such as discount cards/credit cards, etc.) in a card holder or a simple pouch just in case you will have a need for them. You can strap your keys in a key chain holder so that you can quickly find and get them afterward. You will never know when you need to make a call. A good quality camera phone also can save you from bringing a bulky digital camera. 1. Make sure that the lining is waterproof. It is easier to clean them up when spills happen. 2. Look for the diaper bag with multiple compartments so you can quickly find things and keep them organized. Insulated pockets are also good if you want to keep your expressed breastmilk warm or cold. NOTE: If you prefer shouldered diaper bags over the diaper bags backpacks, make sure the strap is thick because thin straps will hurt your shoulder. Thanks for sharing this. I have two children. I am searching for a good diaper bag for traveling. Can you help me with this? Hi i have a two years old baby. I am looking for a diaper bag to travel with my baby. The two most reliable diaper bags I use for traveling nowadays are the Mariego backpack (My Review Here) and the Skip Hop Duo Signature (My Review Here). The backpack is more useful when my daughter was still a baby since I needed my two hands to be free to tender her needs. 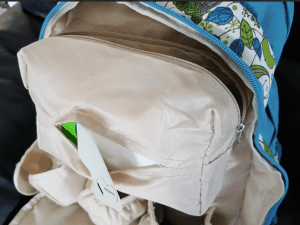 As my child needed lesser demands, the Skip Hop Duo is a good one, too, as I don’t need to carry a baby carrier anymore as well as I need things to be easily accessible, compared to the all secured zippered backpack. Hi, Pitin! Great guide for packing diaper bags. 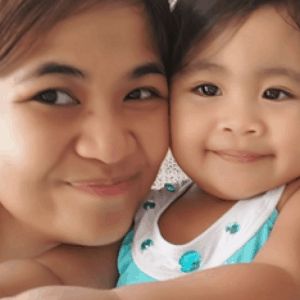 To be honest, I don’t have kids yet, but since I am a lot older than my brother and cousins I had to go through a lot of the troubles and responsibilities that first time parents go through. Especially with my brother, my mother would often give me the mission of preparing his diaper bags, and it would be a lot of trouble as I did not really have an idea of what to pack at first. You save a lot of trouble with your article. Thanks a lot for it! Cheers. Very thorough packing list! 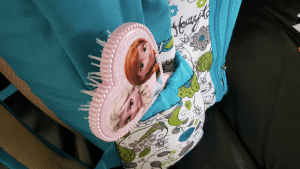 If you have older kids, which I do, the backpacks are great for those little helpers also. Trying to juggle a baby is tough, so being able to place the backpack on an older child was extremely helpful. Now that my kids are older, I still use the diaper backpack from time to time. Mine had lots of little pockets plus a thermal area to keep things cool. It makes a handy storage pack when going on outings or road trips. Often times we buy things for babies but the usefulness ends as soon as the baby reaches the next stage of development. Not for these diaper backpacks. As I said, I’m still using mine and my youngest is 9. Another neat thing about diaper bag backpacks is that you can choose something that doesn’t look like a diaper bag at all. And you can use it as a regular bag for camping and other times that you need a little more space and organization of things. 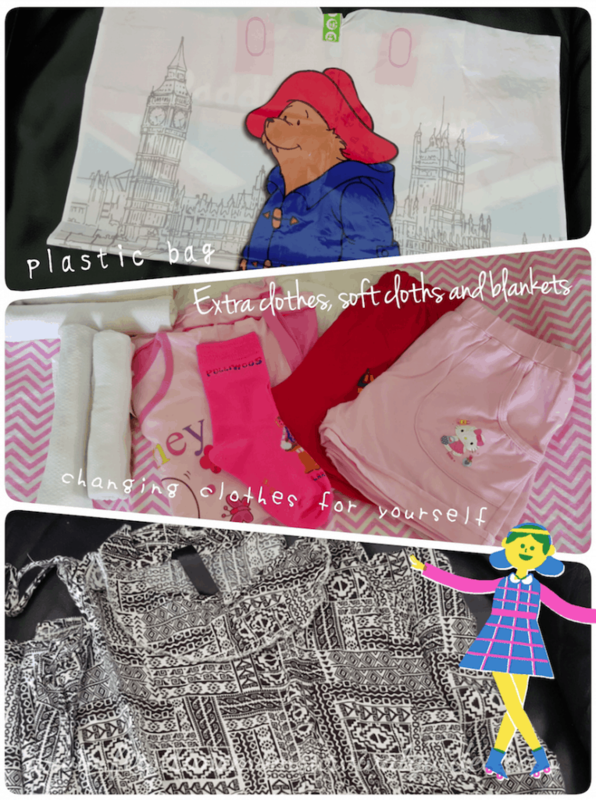 I had not thought to pack some of the things you mentioned, like extra clothes for both the child and the parent. Thank you for this information. Those diaper nappy backpacks look ultra useful and clever idea. I am so surprised they have never thought of them before! Looks like I will need to get one imported. Where do you recommend for me to buy online and what sort of returns policy/guarantee they have? I’m always forgetting something in my diaper bag. From your post I made a check list which I actually will keep with the diaper bag, so I can pack it more efficiently. Can you add printable check lists on your posts? Sometimes packing up my baby can be soooo hectic i usually forget something. Your post will definately help me and I will be looking forward to future posts. Excellent information for first-time parents who are clueless when it comes to being organized! I especially like that you have included the two easily forgotten yet critical items, wallet, and keys! Strapping the wallet to the wrist, though a good idea, but it’ll be cumbersome when you are trying to do some other stuff such as attending to the child’s needs. Perhaps strapping to the waist belt or pant’s belt loop or something might be better; while not in your way, it’s still close to you. Keeping keys somewhere safe yet easily reachable is also an excellent idea so that you don’t fumble around searching for door keys while your baby is wailing at the doorstep!